School board member Mark Mathias advocates for the preservation of the innovation fund at the May 8, 2017 Westport Board of Education meeting in Westport, CT.
WESTPORT — Information technology executive and town Maker Faire founder Mark Mathias is the new chairman of the Board of Education following a unanimous vote by his fellow board members. “I’ve long believed the most important thing we can do in life is to prepare our youth for the future,” Mathias said in accepting the board’s nomination. 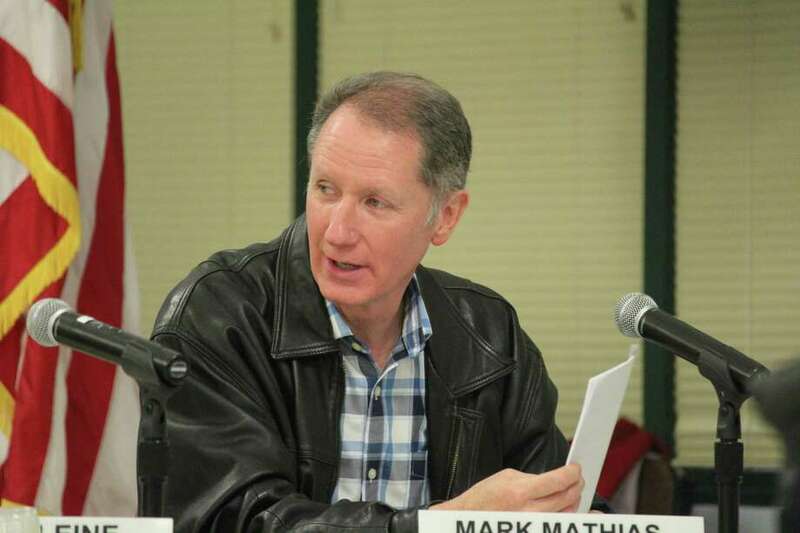 A Democrat, Mathias has served on the school board for 15 years and fills the chairmanship vacated by fellow Democratic Michael Gordon who resigned from the board in June citing a busy schedule. Republican board member and Vice Chair Jeannie Smith filled in as acting chair over the summer and nominated Mathias for the chairmanship at Monday’s meeting. “He’s truly the expert in keeping us centered as a board of ed when we face challenging and unexpected circumstances,” Smith said in nominating Mathias, adding he is not only a valued member of the BOE but an active Westport resident. There are currnetly four Democrats and three Republicans serving on the board. Seven years ago Mathias founded Maker Faire Westport, a showcase of creativity that is now the state’s largest single-day event and last year attracted more than 13,000 people to town, Smith said. Mathias and his wife, Kim Mathias, have two children — Nicole and Nick and have served as a host family for A Better Chance of Westport, a program that provides academically gifted, economically disadvantaged and highly motivated young men of color the opportunity to live in town and study at Westport public schools. “I appreciate Mark’s nearly 15 years of service on the board and, in particular, the creative energy he brings through the use of technology, steam (science, technology, engineering, art, and mathematics), and innovation and most importantly, I appreciate that he shares the board’s passion for and commitment to always doing our very best to meet the needs of the children we serve,” Elaine Whitney, a Democratic BOE member said in seconding Smith’s nomination of Mathias. The board also unanimously re-elected Smith as BOE vice chairman and Whitney as secretary at the Aug. 27 meeting.